Most of us drive over bridges on a regular basis without a second thought, and it is only on rare occasions that we hear about bridges collapsing. Yet, if you really reflect on the weight that these structures support and the critical role they play in our system or transportation, you realize how remarkable bridges are. With this realization, you may be curious about the factors that go into designing a successful bridge. The basics of bridge design and construction can be summarized with the acronym BATS, which stands for beams, arches, trusses, and suspensions. These four components can be combined in a variety of ways to make many types of bridges. Bridge type for each individual situation is generally dependent on several factors, including but not limited to the span it needs to cover, how much weight it needs to support, and cost. 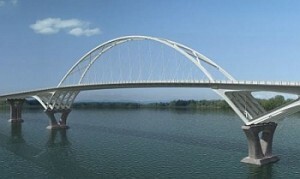 Regardless of the bridge type, engineers must consider the competing forces of tension and compression, both of which can be the downfall of an improperly designed bridge. Although function and visual appeal are important, it is ultimately safety considerations, including the ability to stand up to tension and compression, that determine the final design.